Figure 5. from “Self-assembled PCBM bilayers on graphene and HOPG examined by AFM and STM” by Yanlong Li et al. : AFM images of PCBM bilayer and size distributions of holes at different conditions. (a) AFM image of a PCBM bilayer before annealing. (b) AFM image of a PCBM bilayer after annealing at 140 °C. (c) AFM image of a PCBM bilayer after annealing at 160 °C. (d) Area distribution histogram of holes (without PCBM area) obtained from measurements of the area of holes in AFM images of before (green) and after annealing at 140 °C (dark red) and 160 °C (dark blue). In the article “Effective gamma-ray sterilization and characterization of conductive polypyrrole biomaterials” by Semin Kim et. al cited here, the authors describe the first study on gamma-ray sterilization of PPy bioelectrodes and its effects on their characteristics. 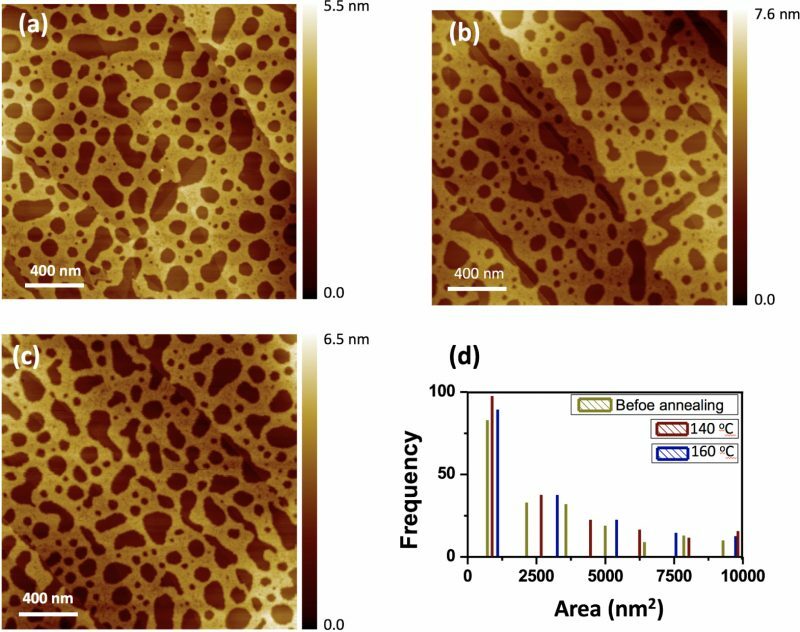 The surface topography and roughness of the PPy and γ-PPy electrodes were analyzed by atomic force microscopy. The experiments were performed using a NanoWorld Pointprobe® NCHR AFM probe. All images were acquired at a 0.3 Hz scan rate in tapping mode. Figure 2 from “Effective gamma-ray sterilization and characterization of conductive polypyrrole biomaterials”: (a) Atomic force micrographs of PPy and γ-PPy samples irradiated with different doses of gamma-ray. (b) Average roughness (root mean square) of PPy and γ-PPy samples. Open Access: The article “Effective gamma-ray sterilization and characterization of conductive polypyrrole biomaterials” by Semin Kim et. al is licensed under a Creative Commons Attribution 4.0 International License, which permits use, sharing, adaptation, distribution and reproduction in any medium or format, as long as you give appropriate credit to the original author(s) and the source, provide a link to the Creative Commons license, and indicate if changes were made. The images or other third party material in this article are included in the article’s Creative Commons license, unless indicated otherwise in a credit line to the material. If material is not included in the article’s Creative Commons license and your intended use is not permitted by statutory regulation or exceeds the permitted use, you will need to obtain permission directly from the copyright holder. To view a copy of this license, visit https://creativecommons.org/licenses/by/4.0/. We have a month with “R” again and the shellfish season has started in the Northern Hemisphere. So we’d like to share the Nature Communications article by Petrone et. al “Mussel adhesion is dictated by time-regulated secretion and molecular conformation of mussel adhesive proteins” with you. A NanoWorld Pointprobe® NCSTR AFM probe was used for the AFM images in this paper. This AFM probe is designed to give extra stability and accuracy during soft tapping mode imaging in order to produce higher quality AFM images while minimizing sample damage. Atomic Force Microscopy (AFM) of mussel adhesive proteins on mica. 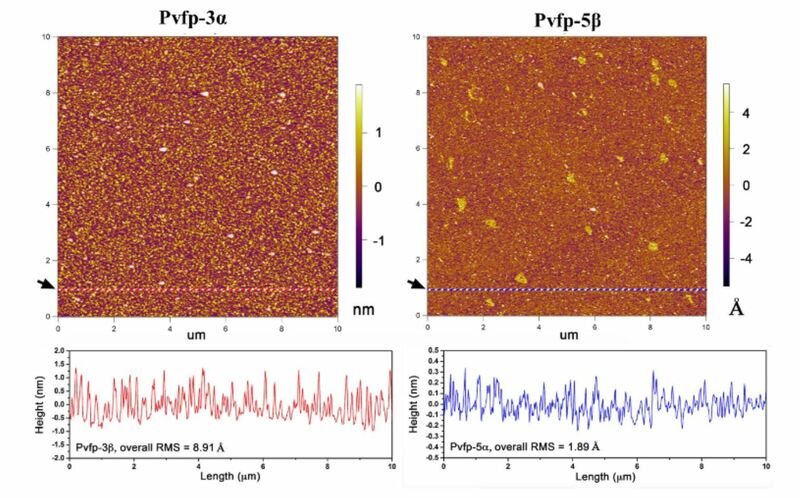 AFM images of dry Pvfp-3α and Pvfp-5β adsorbed from 0.02 mg ml-1 solution in 5% acetic acid and 0.25 MO3 on mica. After 20 min adsorption, the mica surfaces were washed with protein -free buffer, and the AFM images show the homogenous distribution of the resulting adsorbed proteins. The height profiles for both proteins are shown in the graphs below, corresponding to the dotted red and blue lines in the respective AFM images (see black arrows).